But traveling bicyclists know that section of highway over Washington and Rainy passes was designated as part of the US Bicycle Route System last spring. The early start to plowing on the passes is further proof that this has been a lackluster season for snow in the Pacific Northwest. For instance, the snow level at Washington Pass (at right) was only 5 feet, about half the depth as last year. Snow in the avalanche zone below Liberty Bell averaged less than half the depth measured last year in places. All this means that crews are getting at least a two week head start to the job of clearing snow from the 37 miles of highway between Diablo and Mazama. The newly minted USBR 10 rolls across the state for 416 miles from Anacortes to the Idaho border. It was created with the on-the-ground efforts of Washington Bikes, and approved in May by the American Association of State Highway and Transportation officials. The Adventure Bicycling Association, which helps coordinate creation of the routes, reports there are 8,043 miles of US Bicycle Routes established in 16 states. 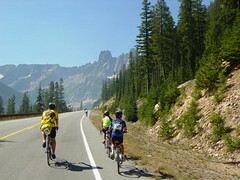 In addition to the newly designated USBR 10, the section of highway also carries Adventure Cycling’s popular Northern Tier Bicycle Route over the passes and through the North Cascades National Park. The Northern Tier stretches from Anacortes, WA, to Bar Harbor, Maine. If you want to beat the car traffic over the Cascade passes, you should read Josh Cohen’s post at Washington Bikes (“Car Free North Cascades”) about riding a bicycle through the area while snowplow crews take weekends off.